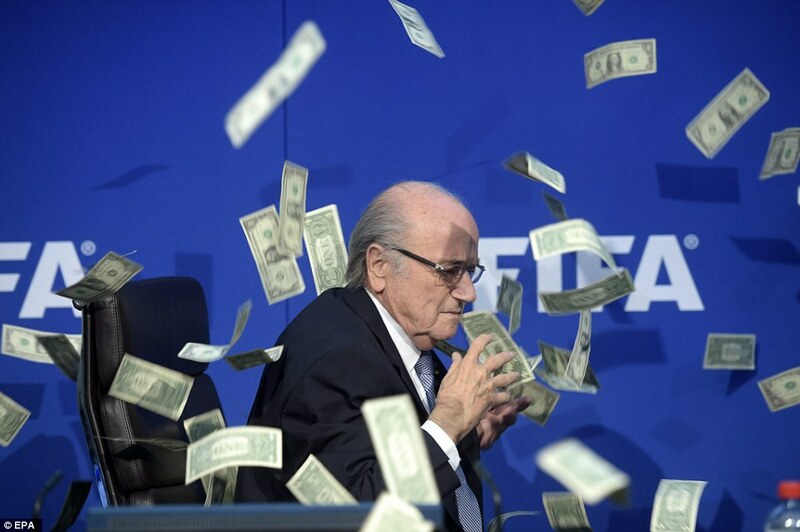 Blatter was showered with fake money in protest at the height of his probe. FOOTBALL. Disgraced former Fifa president Sepp Blatter forced out as head of world football’s governing body amid a corruption scandal in 2015, admitted on Sunday he regretted not stepping down earlier. The 81-year-old was banned over ethics breaches, bringing an end to his 17-year reign as Fifa chief, following a suspect two million Swiss franc payment to ex-Uefa president Michel Platini. “I should have stopped myself earlier,” Blatter said in an interview published by Swiss newspaper SonntagsBlick, adding that his ousting as Fifa boss was “a relief”. Blatter, who was re-elected for a fifth term in May 2015 before promptly announcing his plans to resign, recalled the editor-in-chief of a Swiss magazine warning him the role of Fifa president had an expiration date. “‘At your place the date is 2014’, he told me, and I said to him that sometimes it’s written that the product can be consumed beyond this date if it’s stored in a cool place,” Blatter said. Blatter was also asked about a report in German newspaper Der Spiegel that current Fifa chief Gianni Infantino had feared being dismissed as the subject of another ethics committee investigation. Infantino was cleared last year by Fifa of ethics violations after investigating him over his use of private jets, personal expenses, hiring methods and a contract dispute. But Fifa assured last month “no investigation” had been opened into Infantino after sources said his role in the Confederation of African Football’s presidential elections was being looked into. “I don’t know about that, I only know that former Fifa colleagues addressed themselves because of him to the ethics committee and that three or four weeks later, they were thrown out of Fifa,” Blatter said. Ethics chiefs Hans-Joachim Eckert and Cornel Borbely were replaced in May at the annual Fifa Congress, with Borbely calling the decision “a setback in the fight against corruption”. Blatter also spoke out against the introduction of the video assistant review (VAR) system, currently being trialled at the Confederations Cup in Russia. “The game loses attractiveness… You have to leave referees to make mistakes, what Fifa are doing is delicate and dangerous,” he said.